My kids used to have some shark’s teeth but I think they were given to them by someone. I don’t remember ever finding a shark’s tooth at the beach myself. If I had lived closer to the Florida Gulf Coast beaches, that would have been a different story. The town of Venice is known as the Sharks Tooth Capital. Venice Beach is located about half way down the left side (Gulf side) of the state’s peninsula and it has a coral reef just offshore. Finding pre-historic shark’s teeth seems to be easy to do along this beach according to the Shark Tooth page at the Venice website. Divers, snorkelers and beachcombers are all able to find various types of teeth that have been washed up from the graves of dead sharks decaying in the gulf waters. I know that sharks teeth are also found on Sanibel Island because Pam (i love shelling blog – sharks teeth) writes about finding them there, where she lives. So even though Venice Beach claims to be the capital, you may find sharks teeth on many of Florida’s gulf coast beaches. 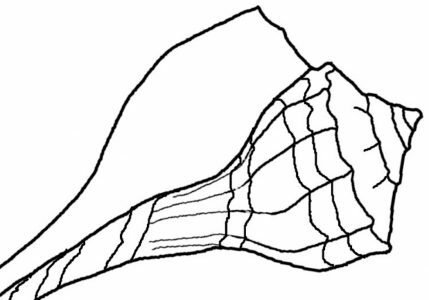 And if you become a shark tooth collector, you’ll have to learn what type of tooth you have and which shark it came from. 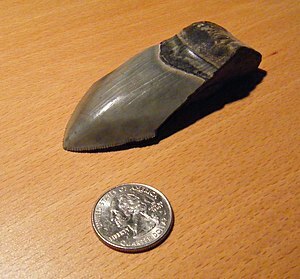 The Megalodon was a huge shark – up to 52 feet long – that is now extinct, but his large teeth (one is shown in the photo here) can bring a hefty price tag. The Megaladon tooth page at Sharky’s Shop (scroll to the bottom) has one that is 7 inches long and will cost you $6,000. 00!!! Whoa! No wonder people scour the ocean floors off Venice Beach!